A previous blog post asked: if you could get up to 10 dB improvement in omnidirectional antenna gain for a given size wideband antenna, would you take advantage of it? 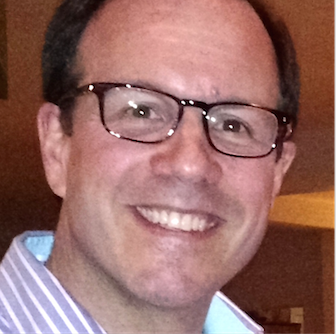 If you are curious about possible benefits, read on. Antenna experts at our partner COJOT have achieved great VHF performance improvement over passive antennas of the same size with their new family of adaptive antennas. By actively switching optimal matching circuits, autonomously or by radio control, these antennas are tuned to radiate best at the frequency of operation. Dynamically adapting RLC values in the antenna circuit to obtain the best impedance match at many frequency bands over a wideband of antenna operation can yield gain improvements up to ten times (10 dB). This is a big deal. 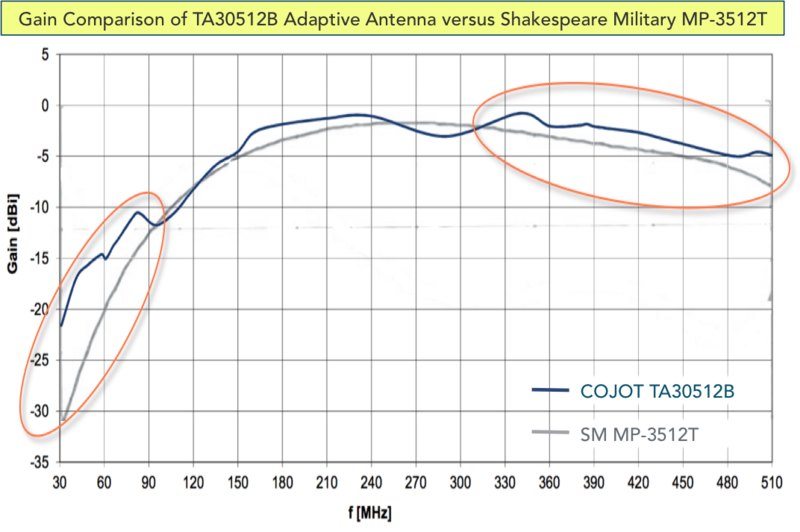 The graph above shows the gain increase achieved by the TA30512B 30-520 MHz manpack ommidirectional adaptive antenna at the hardest-to-improve low end of its frequency range, versus the same-length Shakespeare Military MP-3512T manpack antenna. Note the 10 dB increase in gain between 30 and 40 MHz and appreciable gain boost up to 90 MHz of the TA30512B. Ten times more radiated power in this military communications band means vastly more transmission range, or the opportunity to reduce transmit power to an adaptive antenna to get the same range as a passively matched antenna (that would need much more power to overcome its impedance losses). Also, note the boost of the TA30512B in the important low UHF band where many of the modern software defined radios like Rifleman Radio and JTRS Enhanced MBITR operate. More gain means better range in the field, longer battery life and improved data throughput. Lots of benefits for those squiggly blue lines on the graph above.